I currently am seeing more then one person as FWB and I don’t want to do that anymore. I just want to have one relationship and settle down but I just don’t know which person I should try it with? I currently like them all but some are better then the others. Is that something you could help me with? First of all, wow! I can see why you are having a hard time deciding what direction to go with these five individuals. Each of them has a lot to offer to any life partner. The spread I used to answer Alyssa’s question, using two decks: Caroline Myss’ Archetypes Deck and the pocket version of the Hanson Roberts Tarot. When you look at the photo, you’ll see that I used Caroline Myss’ Archetypes deck, and I drew a card representing you, and then one representing each of the people you asked me about, A., B., C., D., and E. Then, I drew a card from the Hanson-Roberts tarot (a Rider-Waite-style deck), representing what each of those relationships is like, fundamentally. So basically the small cards in the photo show the bonds between you and each person, and the large cards show the people who are involved. And maybe it’s interesting that I chose the word “bonds” to represent relationships, above, because you came up as the Liberator. You’re not interested in bonds, at least, not if there is a chance that they will stop you from being you and from doing the things that you intend to do in life. Any life partner that you choose MUST be someone who will respect your choices and beliefs. You are your own individual and you aren’t the type of person who will be willing to let another person mold you into a role that they think you should play in a relationship. So that’s a nonnegotiable: the person you settle down with MUST let you be you. You are not a home improvement project! You are perfect as you are and your partner must respect that and love you for it. That means that when you get excited about a cause, even if your partner doesn’t share your passion for that cause, that’s okay–it won’t affect the relationship, because you get to be who you are, care about what you care about, and be loved for it. Even if you have different politics or different religions. Your partner doesn’t have to love all the things you love. Your partner just has to love you. Okay–on to person A. Person A came up as a Knight, and your relationship with A came up as the Queen of Cups. I think this person, honestly, does have a role in mind for you, which is fine if that role is who you already are–but if not, then that could be a potential source of conflict. When I look at the Knight and the Queen of Cups, I see someone who wants to be your knight in shining armor, so to speak, and put you on a pedestal–so that you then become the perfect person for whom one would make any sacrifice. No one is perfect, so I wonder about that, and I wonder about this person’s maturity level in seeking someone who is expected to be perfect. But at the same time, the connection between you is very warm and loving, very deep and affectionate. And this is someone who respects you deeply and even looks up to you, someone who would be very loyal to you. Person B came up as Companion, and the relationship came up as the King of Swords. This is another very loyal person; it’s someone who views you as an equal, though, rather than putting you on a pedestal. This relationship doesn’t seem as romantic to me; it seems more intellectual, as if the two of you like to talk together for hours on end and think things through together rationally. This person would be a faithful, loyal companion who is always pleasant to be around–and is someone who is not at all prone to drama. If you want to avoid drama at all costs, this would be the person I’d turn to. I don’t see a lot of passion here, though; what I see is precision, lots of words and ideas, fairness, and equality. Person C came up as Lover, and the relationship came up as the Knight of Cups. So here we have more “knight in shining armor” energy, but where Person A was very chivalrous, Person C is much more passionate and romantic. Here’s where you might find drama and intensity. This person is certainly capable of loyalty and devotion, and the passion of the Lover seems to me to find a good match in the passion of the Liberator. But, this relationship could have its ups and downs–because love and passion do bring ups and downs, that’s part of the deal. You each would be fiercely attached to your own agendas and willing to fight for what you think is best. And since you’re not always going to agree…that could lead to conflict. But then, conflict is part of a healthy relationship. This, in a way, is the kind of relationship that marriage was made for, because marriage is a safe container for commitment, within which two people can fight and have rough times and still feel like their relationship is safe because they have made a commitment to each other. When that kind of passion exists without marriage, it can lead to a situation where two people are constantly breaking up and getting back together. In my opinion. Person D, now, is an utter delight. The Fool–with the relationship as the Hanged Man. My goodness. Of the five people you’ve asked about, this one has the best sense of humor, and has the ability to help you see things from a different perspective. This is the person who can always make you laugh. This person might also be prone to depression at times–often people who have a very keen sense of humor are prone to depression, in my experience. And the Hanged Man suggests to me that this relationship is often delayed, often put off to one side, that there’s always something coming up that prevents you from being able to spend time with this person. It doesn’t have to be that way, though. I want to be sure to note that the Fool is not always a fool–the Fool can often be the wisest person of all, the person who sees things from many points of view, the person who sees the deepest into any situation that may arise. And the Hanged Man is wise enough to know that there is always another way to look at things. In many ways, this person has personality traits in common with Person B–wit, intelligence, rationality, a commitment to equality. This person, though, might never be brave enough to ask you to commit–this is someone who will always have in mind the reasons why that choice might not be best for you. And I tend to think this person might be just a little low on confidence. Or maybe I’m wrong about that, because the Fool also experiences moments of utter “willing to step off a cliff” faith. I of course can’t tell you who to choose. But I hope this helps shed some light on the dynamics involved in your relationship with each of these people. Would you like to comment before I put this on the blog? Thanks for volunteering to do this–this was a VERY interesting reading. Alyssa’s comment: I can’t believe how well out your reading turned out to be. The reading is exactly them, it’s just amazing and yes, this will definitely help me pick someone. Thank you so much Bonnie. Would you like to volunteer for a free reading to be published on my blog? Just write to me at readings@tarotsalve.com. 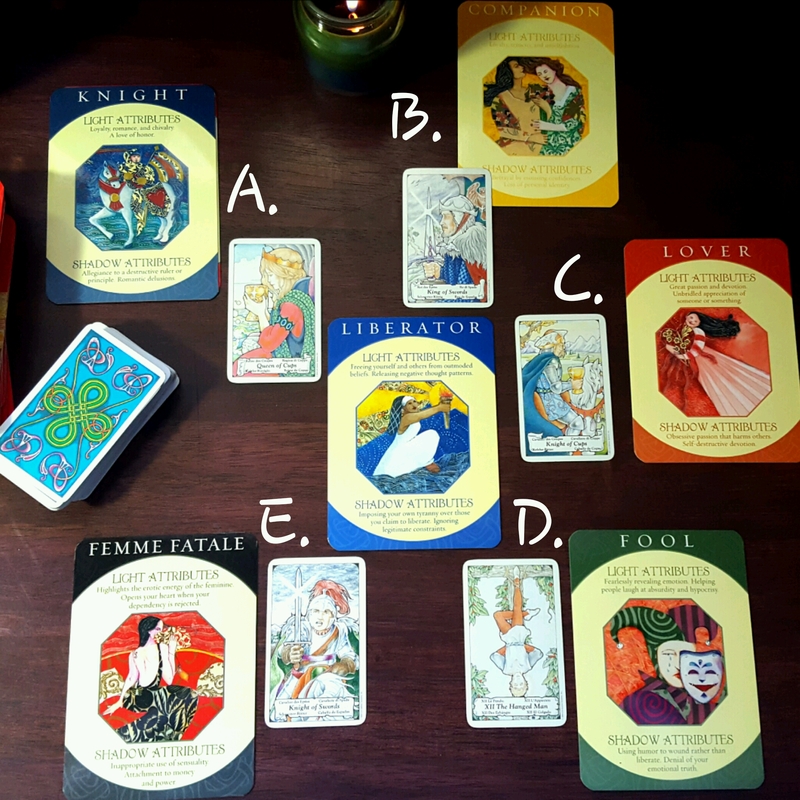 Next Relationship Tarot: When Will We Be Able to Move?